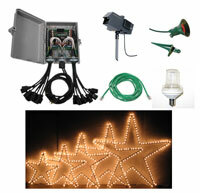 The Extras Add-On Package allows you to add stars, strobes, floods, and projector to your exsisting WowLights/Light-O-Rama Christmas display. Timing for extras available in all Christmas Sequences. Note: Package requires Computer with Light-O-Rama Sequence Editor Software, RS-485 Adapter, Extension Cords, and 2 each Red, Green, White, Blue Flood Light Bulbs. Just getting started? Check out our Christmas Controller Packages.